We all have been waiting for this to happen for a long time and it was possibly the only good thing people could think of when it came to an increased character limit. Well, now it appears that Twitter has listened. You can now share photos and links without it counting towards the character limit. Changing the character limit in this way was a lot better than trying to provide users with 10,000 characters to write whatever they like. 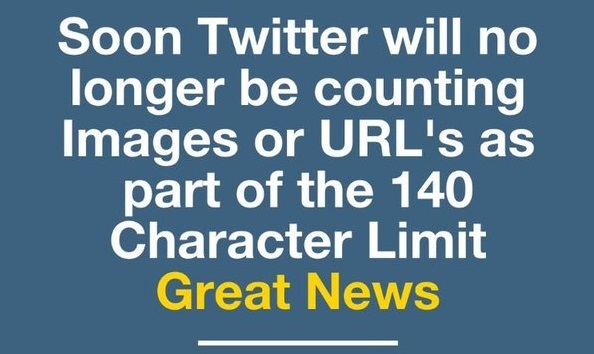 They still need to work hard to make sure that their tweets meet the 140 character limit, but if they want to throw a link or a picture in with it, they no longer have to worry about it counting. Previously a link took up 23 characters and photos 24, this might seem a little weird as link lengths should vary and photos shouldn't need to take up any but they did. Users can now post a photo and a full-length tweet or if they're a business and need to share a link, they don't have to worry as much about title length. This change is subtle and it might not have a really obvious effect but it is a change nonetheless. It seems as if this might have been in the works for a while since Twitter announced the increased character limit. If users had known this earlier, then they might not have been so upset by the announced change. It was one example of how Twitter were failing to make their service more approachable as they were taking away from what made Twitter the service we all know and love. This change will make it at least a little more approachable. Trying to word tweets can be stressful and worrying about fitting a link or an image in just made it even worse. Why bother with all that when you can go on Facebook and make your posts a lot longer and share a few links if you want. It's not an update that will gain Twitter more users, but it should hopefully encourage the users they already have to stick around. Jack Dorsey does need to look at the character limit and maybe they could increase it a little but not by as much as they suggested. This update is a good step in that direction.